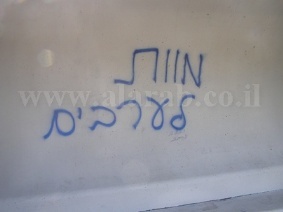 A number of teachers working in Jewish Schools in Israel stated that more instances of racism are reaching alarming levels as more students are expressing their views that exceeded their hatred to Arabs to the level of advocating for killing them.The teachers told Israel’s Yedioth Aharonoth, that they found graffiti witten on school walls and even on exam papers. The most “famous” graffiti was “Death To Arabs”. One student, in the twelfth grade even wrote “Death to Arabs” on his exam paper. They said that the students are showing more signs of violence and hatred directed against Arabs. A student at a School in Tel Aviv told his teacher during class that his dream is to become a soldier so he can exterminate all Arabs; several students in his class clapped in support to his statement. Teachers in different schools said that they saw graffiti stating “Death to Arabs”, A Dead Arab is a Good Arab”, “Kahana Was Right”, and other racist slogans. An Israeli education official told Yedioth Aharonoth said that latest incidents are indicating an alarming level of hatred and racism not only against the Arabs, but also against other minorities in the country. The official said that some Israeli political leaders are responsible for this phenomenon explaining that the issue here is not about a number of extremist students, but a group of ordinary students who became encouraged to express racist attitude due to increasing levels of racism among Israeli political leaders. He added that the student who wrote “Death To Arabs” is a who has very good grades and an excellent school record. A teacher at an Israeli school in the north said that a number of students said during discussion sessions that Arabs are better dead, and that several students expressed attitudes supporting killing all Arabs while students who oppose such racist views are afraid to express their opinions. Three weeks ago, several Israeli teachers signed a petition warning of the alarming levels of racism among Jewish students.